This photography series includes over 250 images. 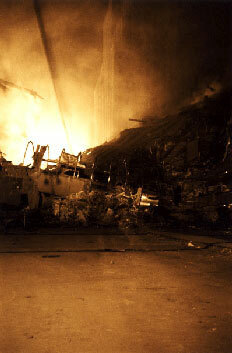 These photos are mainly long exposures only lit by the emergency floodlights of the search-and-rescue teams at the WTC site. A rising wind on the 13th of September made it possible for the first time to photograph the disaster within the immediate vicinity. During that night, the excavation work stopped for the first time due to a suspected gas leak, which allowed specialists to listen for possibly trapped survivors underneath the wreckage - after two days of frantic digging. 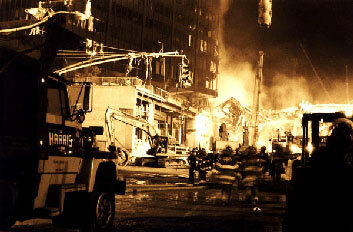 ONEONTA - Karl Haupt said he was out to capture the surreal atmosphere of ground zero when he took a 35 mm camera and about 30 rolls of film to the site and began shooting. It was Sept. 13, two days after the World Trade Center was leveled by two hijacked planes that sliced into the towers in lower Manhattan. 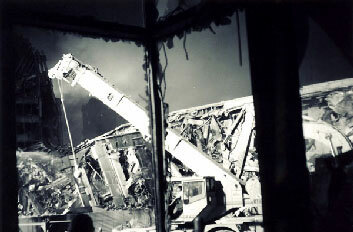 The burning, smoking pile of rubble was still considered a rescue scene by firefighters, police officers and construction workers who gingerly picked through steel girders and dust in hopes of finding someone alive. Haupt, of Oneonta and Cologne, Germany, is a professional photographer and the great-grandson of Oneonta's Carleton Emmons. He drove to the city the afternoon of Sept. 13, walked through the confusion to the edge of the destruction and took photographs until 4 a.m. the next morning. Eighty-four color and black and white images in all were presented by Haupt on Wednesday at Hartwick College in Oneonta as part of the school's Sept. 11 memorial programming. Shot at night, the images, titled "Commemoration 9/11/02," depict what happened on one of the last days of a frenzied rescue effort. 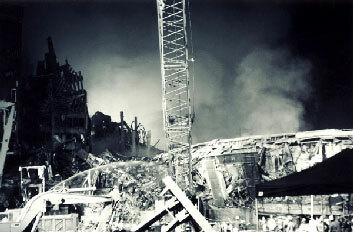 A construction worker clutching an American flag; a section of Tower 1 scaffolding still standing amid the destruction; a cemetery strewn with office paper from the ruined buildings. "It looks like another place and another time," said a woman who attended Wednesday's program. "It's not real." Haupt said it wasn't easy to get close to ground zero. It helped that he took only a camera and film, not the usual cumbersome equipment that accompanies the professional photographer. As he shot he could feel the heat radiating from the pile of welds, pressed steel and concrete. "It was one of the first impressions I got." Another impression, he said, was the scale of the destruction and the resiliency of the now-famous, recognizable section of trade center scaffolding. 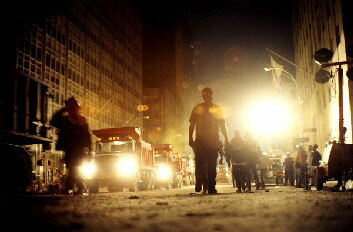 A photographer who has spent time in war-torn Sarajevo, Haupt said what he saw in New York that night was far worse. "It doesn't measure up at all," said Haupt of his war-time assignments. "This is incredible in terms of destruction... "I've seen the images taken during World War II, after the Allied bombings where you could see structures that were destroyed but still recognize them as what they were. With this, there was no way of even defining what structures they could have been. In der Nacht vom 13. September 2001 - zwei Tage nach der Attacke auf das World Trade Center in New York - gelang es dem in New York geborenen und in Köln lebenden Fotografen Karl Haupt, die Absperrungen um die eingestürzten Türme zu überwinden. Heimlich und behutsam begann er die Trümmerlandschaft zu fotografieren, die inzwischen auf Tausenden von Metern fotografischen Materials festgehalten wurde und deren prägnanteste Momentaufnahmen um die Welt gingen. Fast jeder Schritt bei der Aufräumung des Schutts, der nach dieser Katastrophe übrig blieb, wurde dokumentiert und in Ausstellungen rund um den Globus präsentiert. In vielen Fällen wurden jene heroischen Momente gewählt, die den Einsatz unzähliger Feuerwehrleute und freiwilliger Helfer dokumentieren. Nur wenige Fotografen haben zu jener Stunde realisiert, dass es sich nicht nur um einen Terroranschlag auf das Hauptquartier des Kapitalismus handelte, der mit tatkräftiger Medienhilfe auch entsprechend visualisiert wurde, sondern dass es daneben darum ging, die westliche Welt mit einem Schlag in einen Untergang biblischen Ausmaßes hineinzureißen. Dieses diffuse Gefühl, dass es neben der rein materiellen Zerstörung auch um die Zerstörung sämtlicher Werte ging, die das Nebeneinander von verschiedenen Zivilisationen (und Religionen) ermöglichte, kristallisierte sich nach und nach zu einem Kampf gegen den globalen Terrorismus. Das Ursprüngliche an dieser Empfindung konnte jedoch - fotografisch gesehen - nur in einem einzigen Modus wiedergegeben werden: durch gleichzeitige Nähe und Distanz, durch das bewusste Weglassen alles Heroischen und durch die genaueste Fixierung eines Zustandes im Ringen zwischen Leben und Tod, der sich womöglich immer noch in den vor der Kameralinse befindlichen Trümmern abspielte. Eine der von Karl Haupt im Heidelberger Deutsch-Amerikanischen Institut zu sehenden großformatigen Farbaufnahmen des WTC zeigt eine noch lodernde Feuerquelle. Die Flammen erleuchten auf ähnliche Art und Weise die gespenstische Szenerie, wie es etwa William Turner in seinem Bild des brennenden "House of Lords" in London festgehalten hat. Nicht um Details ging es in diesem Bild, sondern um die - durch eine genaue Lichtregie - Wiedergabe der zerstörerischen Kraft, die aus einer realen Feuersbrunst eine symbolische machte. Diese und andere Zerstörungen prägen schließlich die Psyche der Menschen und verursachen, wenn nicht Psychosen, so doch Albträume. 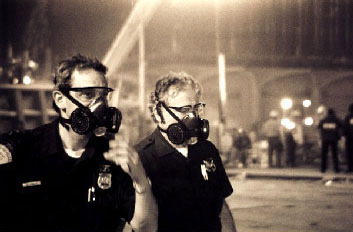 Das fotografische Essay von Karl Haupt mit dem Titel "911 - A Photo Essay of Ground Zero" schreitet entlang dieses subtilen Grats zwischen dem "Symbolisch-Apokalyptischen", wie man es etwa aus der Malerei kennt, und der notwendigen Distanziertheit, die umso prägnanter die Stelle nach dem Zusammenbruch, die unvorstellbare Menge an Leid und die schwindende Hoffnung ins Bildzentrum rückt. Dieses aus schwarz-weißen und aus fast monochrom wirkenden Farbaufnahmen bestehendes Essay ist zweifelsohne eine der besten fotografischen Dokumentationen über die Katastrophe in New York, da sie explizit jene metaphysische Ebene der Zerstörungswut berücksichtigt, die man hauptsächlich den antiken Mythen zuschrieb und nur als vage Drohung in manchen biblischen Geschichten verspürte. In Karl Haupts Essay ist diese metaphysische Ebene sichtbar. 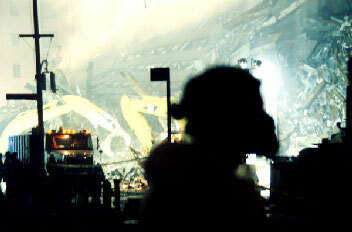 "911- A Photo Essay of Ground Zero", DAI Heidelberg, bis 13. Februar. 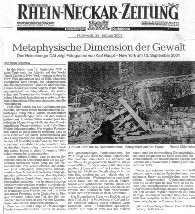 During the night of September 13th, 2001 - two days after the attacks on the World Trade Center in New York - the photographer Karl Haupt, New York born and presently living in Cologne, was able to breach the barriers around the collapsed towers. Carefully and surreptitiously he began to photograph the landscape of ruins that have been captured on miles of photographic material in the meanwhile - and of which the most significant images have gone around the world. Almost every step during the cleanup of the rubble that was left over from this most unimaginable catastrophe has been documented and has been presented in exhibitions around the globe. 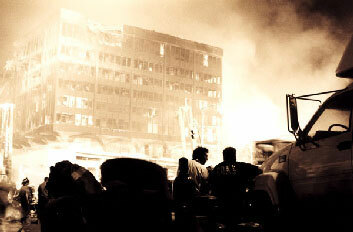 In many cases only those heroic moments were chosen that document the dedication of the countless firemen and volunteers. Only a few photographers realized at the time that this was not just an attack on the headquarters of capitalism as the media portrayed it, but that this was also about tearing the western world down into an abyss of biblical dimensions. Besides the purely material destruction, there is a diffuse sense that this was a destruction of all those values that allowed the co-existence of different civilizations (and religions) - which crystallized by and by into a war against global terrorism. The root of this notion could only be shown -at least in a photographic sense - in one particular way: through simultaneous closeness and distance, by leaving out all the heroics and by capturing a condition locked in a struggle between life and death, a struggle that possibly was still taking place in front of the camera lens, underneath the ruins. 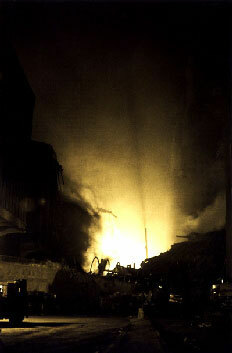 One of Karl Haupt's large-scale color photos shown at the Heidelberg German-American Institute depicts a still blazing conflagration. The flames illuminate the eerie scene similar to perhaps the way William Turner captured the burning "House of Lords" of London in his painting. This picture is not about details, but instead is about the depiction of destructive forces that turns a real blaze into a symbolic one by applying an exact light regime. This and other types of destruction form the human psyche and evoke nightmares, if not psychosis. 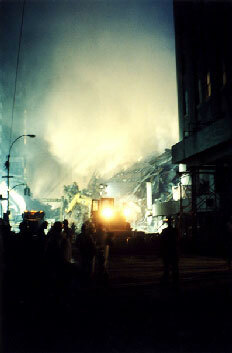 The photographic essay by Karl Haupt with the title "911- a Photo Essay of Ground Zero", walks a fine, subtle line between the "symbolic-apocalyptic", as known from paintings, and the necessary distance to the unimaginable suffering and fading hope by placing the heavy weighing silence after the collapse into the center of the images. This essay of black-and-white and almost monochrome-looking color photos is beyond doubt one of the best photographic documentations on the catastrophe in New York, it explicitly reflects that metaphysical level of total destruction mainly ascribed to the myths of antiquity and biblical stories, looming, vague and threatening. In Karl Haupt's essay this metaphysical level is visible. 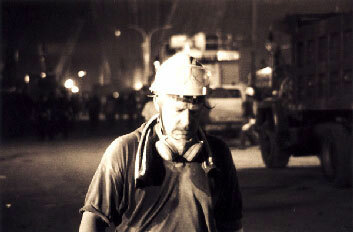 Karl Haupt is a filmmaker and photographer originally from Oneonta, N.Y., USA. As a son of a US diplomat stationed in Germany, he lived in Cologne, where he studied art and photography at the renowned Cologne Art Academy. Out of a need to add a certain social dimension to his art, he went on to study social psychology at the University of Cologne, where he also became involved in acting at the student theatre and later in filmmaking. His complete transition to filmmaking cumulated into returning to New York, where enrolled in the New York University Graduate Film School and earned his Master’s degree in film directing. He worked several years in the New York and Los Angeles film industry, and made himself somewhat of a name as a documentary filmmaker. 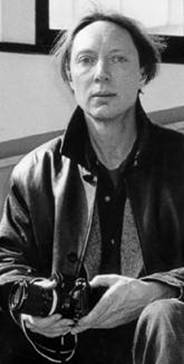 Karl also was involved in analogue music synthesis, and played in several New York and Boston post-punk bands. Later, he moved to Paris, France, where he focused on film and music producing. Also, he spent several years in Belgrade, Yugoslavia, where he shot several war documentaries and where he was manager and producer to a well-known Yugoslav singer and TV personality. Karl has known and documented a highly diverse mix of Belgrade artists, paramilitaries, politicians, and Danube pirates and has gained a certain expertise on wartime Yugoslavia during the time he spent there. Presently, Karl Haupt is producing his feature film projects The Voice of God, a romance set in Cologne, The Coast of Pearls, an adventure story set in the United Arab Emirates, and Shadow Train, an epic WWII refugee train saga; based on his original screenplays. At the same time he is organizing photography exhibitions of 911 - a Photo Essay of Ground Zero and developing other photo projects. 9/11, as September 11th is written as in the US, brought out the emergency services in the greater New York area within minutes of the first airplane attack. Many more followed; some fire trucks and ambulances driving clear across the country to offer their services at Ground Zero - the site where the World Trade Center once stood. Ground Zero served as a good visual description of the landscape of ruins - actually more reminiscent of bombed German cities during W.W. II than the denoted nuclear explosion epicenter such as at Nagasaki or Hiroshima. But for the world it was not a matter of terminology or comparison, but of psychological impact. The sheer audacity, the brazenness of the attacks shocked so completely and left so many millions slackjawed with astonishment that it is clear that the intended shock impact went far beyond the planners' wildest expectations. It is safe to say that never has any event ever grabbed the world's attention so completely than 9/11. It was modern transmission technology that put the world in the front seat - hi-tech media screamed you-are-here-now - and riveted millions of people to their TV sets, some for days. The impression these images made will be with everyone who watched them, and we will remember the 11th of September 2001 for a very long time to come. 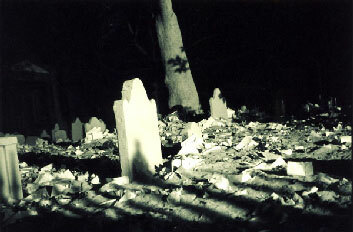 The photographs of this essay were all taken during the night of September 13th, 2001. Although only a short time had past since the attacks, the ruined terrain of the Twin Towers and its environs already seemed different than the previous TV images - in fact, many changes had already taken place. 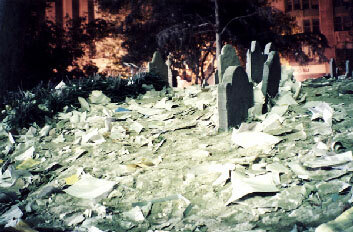 Order had been rigorously applied to stave off chaos; the loose rubble on the fringes of the site had already been removed, thus containing the disaster site to more or less the original footprint of the larger World Trade Center building complex. 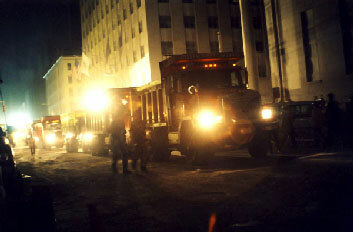 The immediate surrounding side streets east of Trinity Place and the Financial District had been hosed down, although the inch-thick whitish dust layer still clung to shop marquees and covered cars left in parking lots, a substance indistinguishable from a blanket of dirty snow during a New York winter. Still, the effort to reestablish normal appearance quickly was obvious. 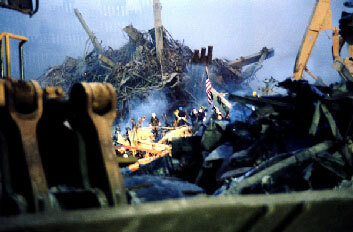 The military authorities had banned all traffic and had kept everyone who wasn't directly part of the emergency effort out of the Zone, as the military perimeter around the WTC site was called. Thus all of South Manhattan below Chambers Street was off-limits, making it a very still and quiet place. This hushed quiet paired with the white sheet rock dust added to the distinct illusion of winter in spite of the pleasant summery temperature. 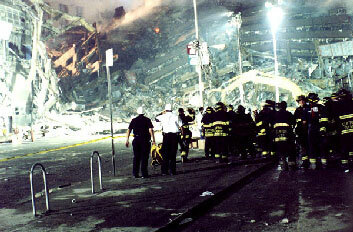 The immediate vicinity of Ground Zero itself was only approachable from the south-east, since a light wind was blowing the heavy smoke plume north-west, making that side of the site unbearable without some sort of breathing mask. 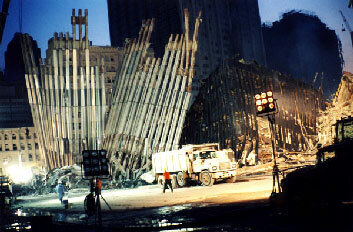 Southeast is Liberty Plaza, one of the few vantage points that allowed a direct view of the WTC tower wreckage. This wide plaza served as the staging area where the U.S. president would arrive at some fourteen hours later. Liberty Plaza was bursting with activity, in sudden contrast to the quiet side streets of the Zone. Here this was a military operation in full swing; helicopter gunships hovered overhead, army sentries stood guard while the Secret Service prepared for the president's next day visit. 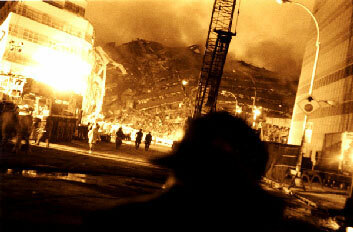 The staging ground of the plaza was no more than 30 yards away from the depth of a chaotic jungle of twisted steel girders and ragged remnants of exoskeletal framework. 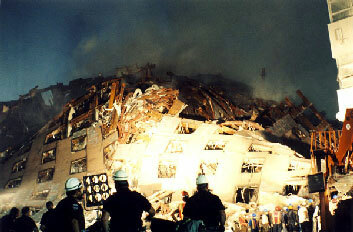 Here, the huge piles of indefinable smoldering mass - the ultra-compressed ruins of the South Tower - lay in plain view. Few press photographers had made it to this vantage point ever since South Manhattan had been turned into a military zone. That evening at least two press photographers who had found a way to Liberty Plaza were apprehended and escorted out of the Zone again. The press was definitely not wanted. 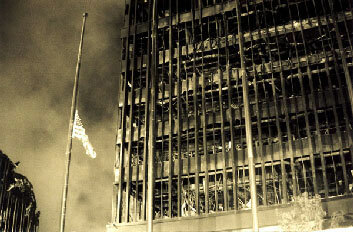 The evening of the 13th September was a special moment in the annals of the World Trade Center disaster. Besides the presidential security preparations there was a major concern about a suspected gas leak somewhere deep down in the mountain of rubble. The search-and-rescue operation and excavation work was stopped. The emergency squads, construction workers, and welders were called off, some of them emerging from the grotesque, perverse mess covered in grime and soot, bone tired. This moment was also a cut-off point when the emergency management officials decided that there was no hope of finding anyone alive in the ruins anymore. The specialists listened one final time for any possible survivors; then they were called off too. The helicopter gunships pulled out, the Secret Service finished their work and left. For the first time the hectic activities at the site had came to a halt. The ensuing silence was extraordinary. This photo essay attempts to describe this silence and the unreal, surreal atmosphere of Ground Zero and the Zone. Although photojournalistic by nature, this photo essay is different from the TV images we all have gotten used to. Although these photos have documented the same reality, they have found a different way of describing it. These are not photographs that shock; instead they invite the viewer to look at what was in front of the camera lens at that particular, extraordinary moment. 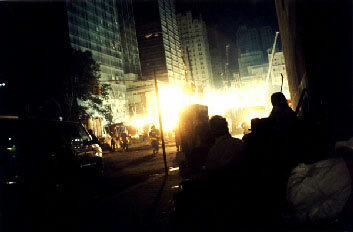 Ground Zero was only lit by the on-site floodlights, all of South Manhattan was otherwise still without electricity at this time. 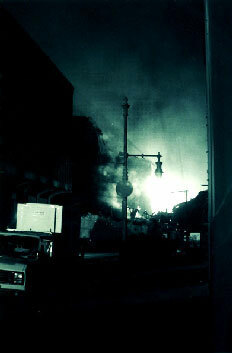 The area was completely engulfed by darkness as night fell, save for the brilliantly lit Ground Zero site. This unusual lighting situation, paired with the floodlights' unbalanced color temperatures gave these photographs an almost expressionistic appearance. This night was only a moment, but a particular moment plucked from a long recovery process which changed rapidly with the circumstances, in the meanwhile almost all traces of the World Trade Center and Ground Zero have vanished completely. In fact, there are only photographed images left, that and our memories. The photographic challenge of this essay was to look beyond the shock imagery of 9/11 and describe Ground Zero and its surroundings from a different perspective. To create images as distinct and unique as these it was necessary to pay attention to the atmosphere of the area. It was important to develop a sense of place and moment and to look beyond the shock and confusion, to see more than trauma and chaos to convey a sense of presence, of being there. 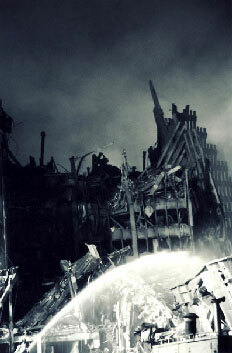 Thus, these photographs concentrate on the atmospheric; they focus on the strange, unreal and unbelievable environment of the World Trade Center disaster - pictures from the beyond - as one comment describes them. This is really war, like images of German cities at the end of World War II. Only the primordial forces of the firmament should be allowed to wreak such destruction, which then would be really God-given. Sept. 13th - A large building complex just across the West Side Highway from the Twin Towers, The World Financial Center, was badly damaged by the WTC collapse, but only on its exposed side. 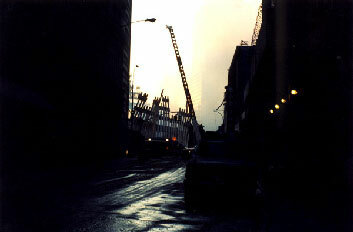 The North Bridge, a pedestrian bridge that spanned the West Side Highway and which had connected the WTC North Tower with the World Financial Center, had also collapsed. 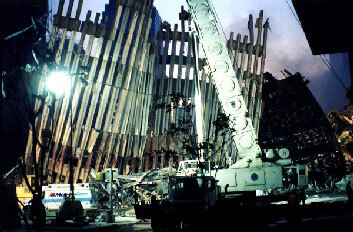 Since the World Financial Center was otherwise structurally intact, it was used as an on-site command post and staging area for the rescue teams working in the North Tower area. A hotel lobby inside the Financial World Center served as a makeshift clearinghouse for the volunteer workers, firemen and medical personnel, where also some of the basic organizational tasks were managed. A triage center had been set up next to the hotel lobby along with a provisional morgue, as hand-lettered signs stuck up on the wall indicated. The lobby itself had thick power lines running through it and was cluttered with the fire fighting equipment of the relieved rescue workers, who sat wearily on the marble floors, drinking coffee. The large picture window panes had been blown out by the collapse; jagged glass shards still hung from the window casings, which ominously framed the apocalyptic view beyond. The twisted steel beams of the North Bridge wreck in the foreground with the remnants of the North Tower's exoskeletal girders rising up behind looked definitely unreal, almost like a stage designers' ultimate vision of doom. Further inside the World Financial Center building complex was a makeshift warren of passageways that led from the debris field of the WTC North Tower through the building to the North Cove Yacht Harbor on the other side. Along this route through the building was one of the most prominent features of the Financial World Center, the several-floor-high, greenhouse-like glass structure of the Winter Garden, which had been partly shattered by the flying debris of the collapsing tower. Glass shards littered the marble floors where chic indoor cafes and bars had been just two days ago, the tall palm trees of the Winter Garden shredded, their wrecked fronds silhouetted eerily against the gray smoke plume beyond the shattered glass walls. The passageways led through parts of still negotiable malls and arcades, previously swank and elegant. Now filthy, torn up and drenched in dirty water, they served as one of the main access routes for the volunteer workers from and to Ground Zero. Getting through these passageways required a flashlight and some caution, since there was no electricity in the building complex. Site workers traversing the passages shouted warnings to each other, pointing out potential hazards on the dark and flooded floors, as well as twisted strips of framing material hanging from the ceilings. The smoke was also quite bad and made it difficult to see one's way; most people had either dust masks or had wet bandanas pulled up over their faces. On the far side of the World Financial Center the passage ended at the yacht harbor on the Hudson River. Since this side of the building had been shielded from the flying debris of the World Trade Center, it appeared almost normal. Stepping out into the open, it took a moment to get used to the otherwise rather exclusive yacht harbor surroundings after the just traversed war-like wreckage. Also, for the first time breathing was easier; the smoke did not reach this protected enclave. The harbor itself was now used to offload barges ferrying emergency supplies from across the river from nearby Jersey City, all under the guns of a coast guard cutter docked alongside. Forklifts carted a myriad of gear up a makeshift ramp to various depots, which already held vast quantities of materiel. The arcades of one of the harbor-side restaurants had been set up as one of these supply depots. Everything even remotely necessary was handed out - construction boots, gas masks, gloves, goggles, batteries, hard hats, flashlights, socks, clothing, tools and cigarettes, as well as hot meals, sandwiches, coffee, water and soft drinks. In a way it resembled a cookout at a military supply dump, except that the food, being donated by local restaurants, had nothing military about it. In fact, the spare ribs and barbecue chicken were highly praised by the site workers, who sat on the harbor-side stairs with their food-laden plates or stood clustered in groups discussing the operation, very garden party-like, belying the catastrophe just 100 yards away. The night of the 13th September was also populated by medical teams and emergency services. 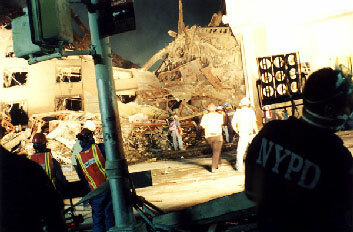 As activities were halted at Ground Zero, the site workers headed towards the emergency shelters, some of them set up in the nearby schools. 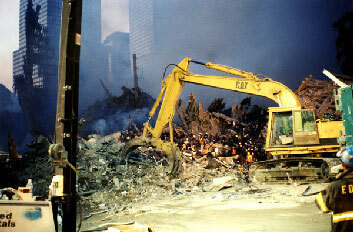 One of them was in the Stuyvesant High School in Battery Park City, less than 700 yards away from Ground Zero. There the American Red Cross and several other emergency agencies provided food, showers, and fresh clothing. The huge gym was used as a rest area, where the workers camped out on cots and bedrolls, some sleeping properly for the first time since the attacks. Several first aid stations were set up in the building, fortunately most of the conceivable scenarios had not materialized - there were very few wounded and injured to take care of, there were also few smoke-inhalation cases that had to be treated. A few workers had cuts and bruises, also a sprained ankle was bandaged, but mainly the medical staff was busy with applying eye drops to those workers who had spent too much time in the acrid smoke plume and who were suffering from minor eye irritations. Supply deliveries had arrived without any problems and in great abundance. Several distribution points handed out fresh clothing, shoes, blankets, pillows and toiletries to the tired and weary. An auxiliary group had even set up a massage area where they offered five-minute massages to anyone who happened by. On the higher floors other field kitchens provided more hot food, coffee, and snacks. Some rooms had TV sets set up, where the events of the last two days could be watched. Late at night things settled down gradually and the auxiliary groups now had a peaceful moment for themselves too; many had been on duty for the last two days and now had the first moment to breathe easily, knowing that the immediate pressure was off. One of the team members, Shelah Desmond, a young nurse from Brooklyn, spoke of how she had been with one of the first ambulance teams from Brooklyn who had responded to the initial call for help. She had spent the last two days alternating between her ambulance and the emergency shelter, helping with setting up one of several first aid stations as medical supplies arrived. Desmond pointed out her ambulance from the window, one of several hundred lined up along the West Side Highway, a 2-mile long line of ambulances reaching all the way up to the West Village, looking like a city of campers under the floodlights. Rob Barre, a trauma psychologist at the shelter, commented on the ambulances, saying that this was one way how people dealt with crises, they wanted to do something, anything. Some of those ambulances had driven all the way from Texas, he had heard. But he didn't think this was so much a heroic act as described in the media, but more a kind of impulsiveness, fulfilling a personal need to fix things or just to be there. Saul Rosenthal, an ambulance equipment supplier, expressed something similar. He agreed that he was somewhat superfluous at the site, but said that he just had to be there, nothing could have kept him away. Disaster tourism perhaps? Rosenthal shrugged to that, he had the chance to be there and he had taken it, he didn't care what anyone thought of it, being there was far more important to him. A policeman also was keenly aware of place, time, and the larger picture when he asked for a spare roll of film. He had photographed all his police buddies with "the pile" in the background, but ran out of film before they could take a shot of him. So he needed a fresh roll, he explained, photos for the family and back at the station. This need to record and document that one had been there was equally important for two construction workers, who had overheard the policeman and who made fun over his "almost missed stardom". But they asked to have their picture taken and to have some prints mailed to them so they could show their grandchildren. 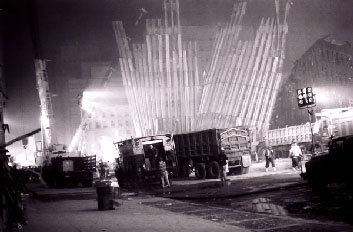 They needed proof that they had worked at Ground Zero, for later times. A photograph would speak more than words. A huge electrical rainstorm swept over Manhattan that night, heavy lightning illuminated the Zone in a most spectacular, apocalyptic and eerie way. 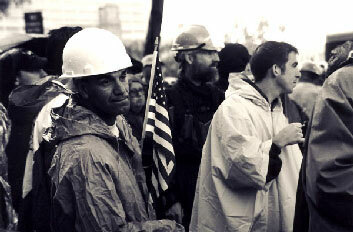 Most of the workers had found their way to one of the shelters, while others still busy with moving heavy equipment were outfitted with raingear from the supply depots. The heavy downpour only stopped during the course of the following morning; much of the media had left, the spectators at the barriers had gone home. 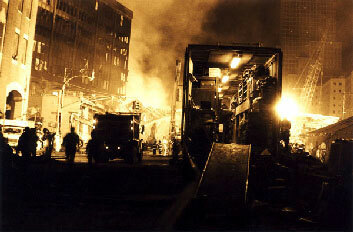 The rain extinguished many of the fires that had been burning inside the rubble; the smoke plume was greatly reduced. Most of the whitish dust had been washed away; the Zone appeared completely different than just 16 hours before.